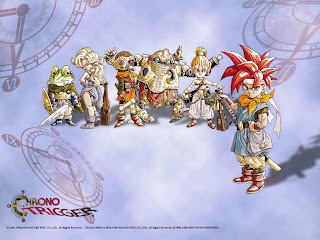 A while back, I was cruising around the Internet, looking at Chrono Trigger stuff (surprising, I know), when I found something amazing: an official Chrono Trigger animated short, Dimensional Adventure Numa Monjar (which I've embedded below). A quick jaunt over to Wikipedia confirmed that it was created back in 1996 and screened at a Japanese manga festival. It's great fan service for Chrono Trigger devotees: A Nu and Mamo (one of the kilwala enemies) are a Laurel & Hardy duo looking to make it big at the Millenial Fair. Unbeknownst to the humans, the game's monsters put on their own celebration the night before the fair opens. Pratfalls abound as old favorites like Gato (or "Gonzales," as he was called in Japan) and Johnny show up to celebrate. In this age of tightly controlled corporate tie-ins and meticulously constructed expanded universes, it's rare to find spinoff content that hasn't been carefully packaged for consumption. In fact, the mid-1990s was probably the end of the era where you could be completely surprised by some kind of transmedia content. And now, thanks to the Internet, it's easy for fans to create and distribute their own tributes to huge audiences. None of this is a bad thing (especially the ease at which fans can spread their art), it just makes it less mysterious and surprising when you run across extracurricular material. I still remember when I happened upon the Zelda manga in Nintendo Power. Suddenly, the bounds of a game I loved seemed bigger, it's legend (pardon the pun) richer. Similarly, the Chrono Trigger anime offers an alternative look at the characters and world I love. It expands on characters I know and love while keeping the same quirky sense of humor found in the game. It's fan service and that's ok; anyone who cares enough to watch is also the same kind of person that will get the weird visual jokes and cameos. It's a strange, charming little detour that expands the a beloved game's world.